The interior of the Eppendorf Centrifuge 5425 also comes equipped with new technology for optimal performance. The rotor chamber is made of stainless steel to ensure durability and cleanliness. The chamber also includes OptiBowl technology, designed for optimal sound dampening, which means the Centrifuge 5425 operates at a whisper quiet level. 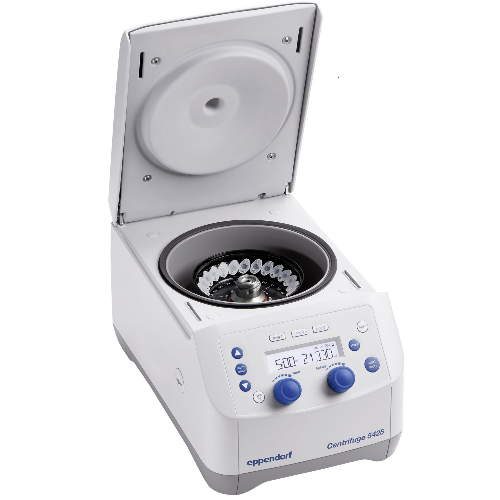 The Eppendorf Centrifuge 5425 is also designed with ease of use in mind. The display is easy to read and is user friendly. The interface is simple and designed for quick use, with knobs or a keypad for easy cleaning. Furthermore, the Centrifuge 5425 has various new software additions to improve user accessibility. The display now shows time elapsed since the last run. There are also 3 programmable buttons to quickly access frequently used settings.